Seborrheic keratoses (SK) are very common skin growths. They may seem worrisome as they can look like a wart or a skin cancer, but they are completely harmless and can easily be removed by our dermatologists near Boston. SK’s tend to develop in middle age or older and increase in number over time. They can be seen almost anywhere on the skin, but favor the chest, back, head and neck. SK’s typically start as small rough bumps, and slowly thicken to take on a warty surface. Classically, they have a waxy “stuck-on-the-skin” appearance. The color can range from white to black, but most are tan or brown. The relationship of SK’s to past sun exposure is controversial, but they are seen more in fair skin people. 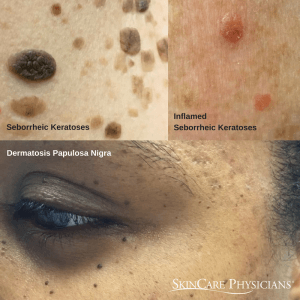 A variation of SK’s in darker skin individuals, known as Dermatosis Papulosa Nigra (DPN), appears as small lesions around the eyes. A dermatologist may be uncertain of the diagnosis and remove the lesion as a biopsy. SK’s can get irritated or inflamed causing itch or pain. Common triggers include rubbing against clothing or jewelry or trauma with shaving. Some patients simply find them unsightly. Liquid nitrogen: Destroying the lesion with a cold freeze is perhaps the most common method used. Occasionally, this heals as a light or white spot. Electrosurgery: Using an electric current to treat small lesions, particularly useful for DPN. Curettage: Using a scoop shaped instrument to scrape off the lesion. Occasionally, this can leave a scar. Eskata™: A new approach using high strength hydrogen peroxide. The FDA-approved product is applied to up to 4 lesions in the office during a 15 minute appointment. Although most spots will resolve within 3 weeks, a second treatment is possible. Scarring or residual discoloration of the skin is less commonly seen with this method. If you are bothered by one or more seborrheic keratoses, your dermatologist can help. Make an appointment with one of our dermatology providers near Boston to discuss the best suited options to remove them. SkinCare Physicians is proud to offer efficient and safe procedures for seborrheic keratoses, including the newest topical treatment, Eskata. One final advice: While seborrheic keratoses are neither cancerous nor harmless, see your dermatologist if you have any doubt about a skin growth. Don’t delay! I read the clinical study of Eskata and it looks like there was roughly a 15% success rate. If this is correct, that’s not a glowing endorsement of this treatment, is it? How would Eskata be superior to laser treatment of SK? Thank you for your question. There are many possible methods to treat seborrheic keratoses. Eskata is best utilized on facial locations as it is less associated with the chance of post treatment discoloration. Other methods such as cryotherapy or surgical removal have a greater risk for this complication. In a situation where the seborrheic keratoses are still very tiny, is there any simple treatment for it before it gets bigger? For thin keratoses in non-facial locations, daily application of an emollient containing beta-hydroxy acid, such as Amlactin lotion (available over the counter), is sometimes helpful. For the face, you can try a topical retinoid cream.